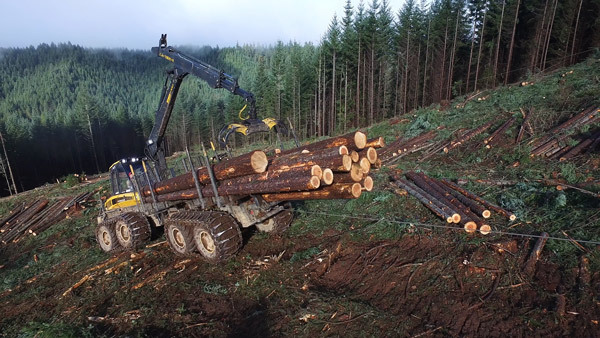 The use of cut-to-length (CTL) methodology is an approach that allows Miller Timber Services to increase the return on saw and non-saw log volumes recovered from the stands. The cut-to-length approach eliminates the landings and soil disturbance associated with conventional tractor logging and burning of slash on landings. This approach is highly effective when the in-the-woods harvesters are coupled with forwarders. The in-the-woods harvester will fall, limb and buck trees into logs in the stand. During the process of falling, limbing, and bucking trees, the harvester is able to create common-use trails (used by both harvester and forwarder). Trails are typically established 60 feet apart and pre-marked in straight rows. 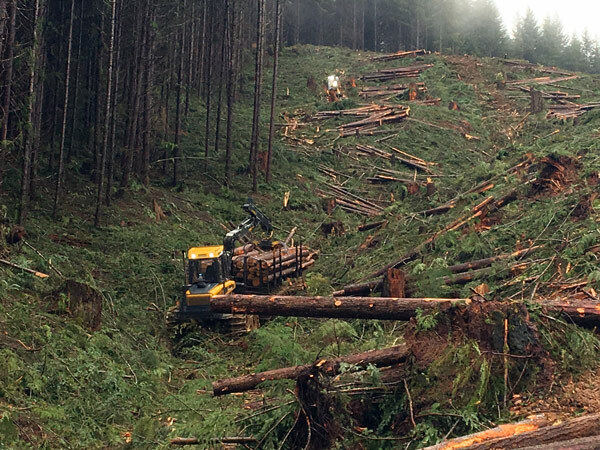 The limbs, tops and brush are pulled into the skid trail as a base on which the processor and forwarder may run. Utilizing this approach, the travel of both harvester and forwarder break down limbs, tops, and brush, accelerating the decay and nutrient cycle processes. This approach also provides a cushion of protection against soil compaction. The use of in-the-woods harvesters also ensures greater accuracy in diameter and length measurements, producing a cleaner log while maximizing volume. Where terrain and soil conditions permit, trails parallel to forest access roads may be created to allow harvest of selected trees and the removal and placement of limbs/slash in trails well off the roadside. Where terrain does not allow this approach, harvest may be performed from the roadside. In such an application, limbs and slash can still be removed a safe distance from the roadside thanks to equipment boom-length. Care is taken to ensure that drainage ditches along roadsides are free of limbs and slash. The end result is an aesthetically pleasing roadside buffer free of limbs/slash. This practice also reduces fuels along travel roads. 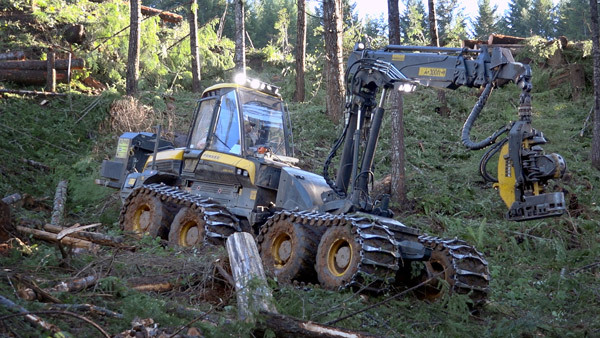 The forwarder is used to pick up saw and non-saw logs from the forest and transport them to the roadside, where they are sorted and placed in decks, thus eliminating the need to establish landings. Once these decks have been established, logs can easily be loaded onto trucks and delivered to local mills. Loading may be accomplished by having the forwarder double as a loader, or through the use of a dedicated log loader. The use of a dedicated log loader enables parallel processing (forwarding and loading), thereby shortening the overall process time. Thinning is the cutting and removal of select trees from a stand to promote healthy growth, desired spacing and optimal growth of the remaining trees. Low-light forests showing little to no signs of understory growth are quickly transformed into healthy forests. If the cut trees can be marketed the thinning is considered “commercial”. If harvested trees are too small to sell, the thinning is considered “pre-commercial”. Great care is taken during the thinning process to avoid damaging the residual trees. Like other crops, trees grow poorly if there is competition for resources such as water, nutrients and light. The deliberate control of stand density by thinning can improve growth rate, vigor, reduce wildfire threat, improve wildlife habitat, increase plant diversity of the forest floor, and improve aesthetics and overall forest health.